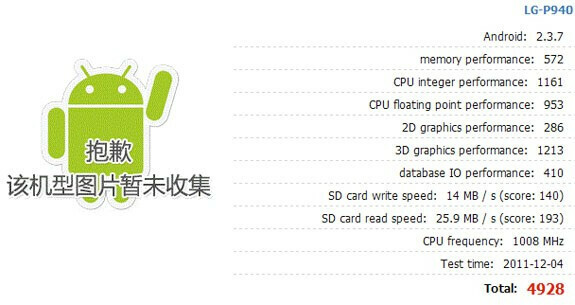 Recently a site called Antutu displayed the results of a benchmark test for a handset called the LG P940. If that sounds familiar, it is because a few weeks ago a loyal reader sent us pictures of the phone which was called the LG Prada P940, or the LG Prada K2. Additionally, this model recently made it through the guys at the FCC with NFC support in tow. The benchmark results, now taken down by the site, revealed that the phone is powered by Android 2.3.7 which is a nice change of strategy by LG as the first two Prada branded handsets were featurephones, including the first LG Prada which is known as being the first commercially available touchscreen handset. Earlier this month, invitations were sent out for a event scheduled on December 14th at which the Prada phone by LG 3.0 is expected to be introduced. This is just another name, albeit more formal, for the LG Prada K2. Whatever name you use, the thin 8.8mm device has a 4.3 inch LCD NOVA display with a 1GHz TI OMAP4430 dual-core processor with 21Mbps HSPA+ connectivity. The rear and front-facing cameras come in at 8MP and 1.3MP respectively. Of course, with the Prada name on the device, it will probably be a must have accessory among the fashion conscious overseas when it is expected to launch early next year. The first two Prada versions never made it to the States, but perhaps as a smartphone a trip across the pond is more likely. Well, that is much closer to my RAZR's results, but how do we know those pics are showing the scores of the Prada?